Can Money Buy Happiness? Rethinking Your Resolution?Can Money Buy Happiness? Rethinking Your Resolution? One of the premises of my book is that wealth goes far beyond the financial realm. A future blog post will discuss this in more detail. With the new year approaching this, is the time of year when many people make resolutions for the year ahead. I thought I would illuminate some very interesting research about money and happiness that may help influence readers in terms of what to focus on when it comes to their resolutions. Awhile back there was an interesting article in the Wall Street Journal entitled Can Money Buy you Happiness? I am going to highlight what I found to be the most important takeaways from the article. I found it to be quite interesting and thought provoking and I hope it has the same effect on you. After a certain level of income, it’s more important how one spends their money than making more money. Experiences have a much higher return on investment than material goods. 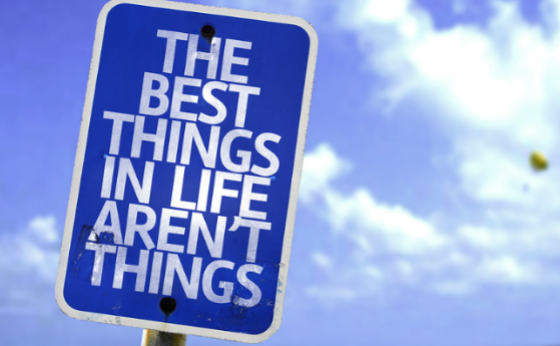 Experiences vs Material Goods – Can Money Buy Happiness? “What we find is that there’s this huge miss forecast,” he says. “People think that experiences are only going to provide temporary happiness, but they actually provide both more happiness and more lasting value.” And yet we still keep on buying material things, he says, because they’re tangible and we think we can keep on using them. 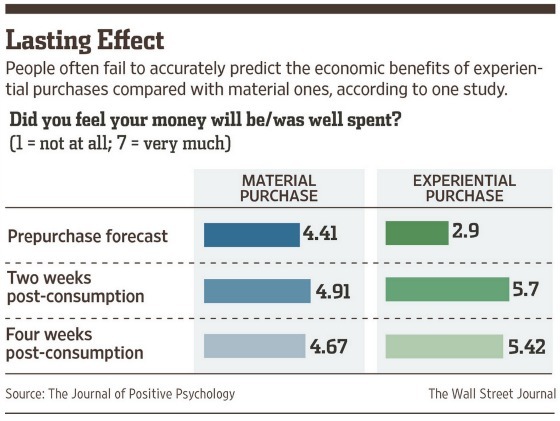 The following table shows how people misjudge their expected level of satisfaction prior to purchasing a material good and investing in an experience versus how they actually rate them after some time has passed. It’s not that material goods don’t bring them a higher level of satisfaction. They do, as the table shows. Rather, the expectation for experiences is so low that we are really surprised by how satisfying they end up being and that halo effect continues to stay with us after the experience has been completed such that the absolute level of satisfaction exceeds that of material purchases. The new dress or the fancy car provides a brief thrill, but we soon come to take it for granted. Finally, build up savings first and avoid debt if possible. After reviewing the research are you rethinking your financial New Year’s resolution? Will you choose possessions or experiences? I’d like to hear your thoughts. Whichever you choose I’d like to wish you a Happy New Year and I hope you have a prosperous and healthy 2015! Bravo for shining the light of words on this topic, Gary. We have focused on investing in others’ well being (The Hunger Project and others) for nearly 40 years and taking great international trips as often as we can for the last 20. The joy and satisfaction from both have proven to be meaningful, profound, and very sustainable. Dwight, you and your team have really “walked the talk” in this regard and been on the leading edge of bringing awareness, focus, and commitment to this area of well being.